By Mark Lassagne, editor-in-chief of Bass Angler Magazine and Steve Rajeff, chief rod designer G. Loomis. Spinning, bait casting, and big surf rods have as many rod-blank build nuances as any fly rod. Think tip and modulus’ along with hundreds of adhesive, epoxy, scrim, thickness, and recipe combinations that change all those posted modulus numbers. The craft of making any fishing rod has similarities that cannot be ignored. Mark Lassagne presents a clear enough picture of the essential intendment of fishing rod design to appreciate the fact that a rod company’s recipe of tweaks is not just a PR postulation. Manufacturing a fishing rod is a long process of testing sophisticated material interactions. To come up with a successful rod that is stronger, lighter and cast farther is an art form cultured by science. Measuring and cutting the graphite pre-peg, tacking, rolling, cellophane wrapping, oven, pulling, sanding, painting, ferrel, handle, logo, tip-top, thread wrapping, finish, inspect, package and ship don’t even account for the hands-on all the way through the process. All of the latter aptly explained by Steve Rajeff in the video below. 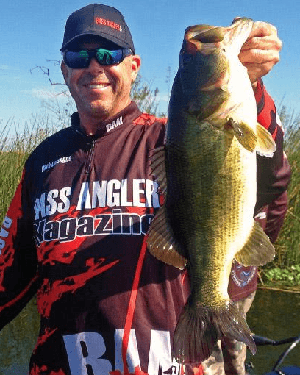 Mark Lassagne, a consistent bass tournament winner. Bass Angler Magazine photo. Arguably the most important part of a fishing rod is the blank. The blank is the flexible portion between the angler and the lure or fly. Blanks come in many shapes, sizes, and colors, similar to golf clubs they are made with different materials to create a particular action for specific outcome. The material used to manufacture fishing rods is called pre-preg. Per-preg, which looks like a thick cloth – consists of resin, scrim plus graphite or fiberglass. The scrim is a very fine (.001”) fiberglass screen that holds the graphite or fiberglass material together (keeps rods round during stress), and resin – a specialized binding agent that when heated bonds the materials together. There are thousands of combinations of pre-preg where each rod manufacturer configures their recipe to fit their exact needs of resin, scrim and rod material. The pre-preg arrives at the rod manufacturer in a large roll similar to a large roll of paper you’d see at the craft store. One difference is pre-preg must be stored in the freezer; otherwise, the material could start the curing process rendering it useless. Yes, there is a freeze thaw technique to avoid the obvious. 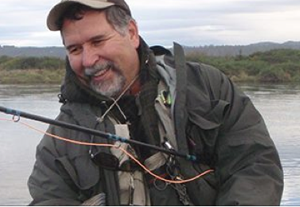 Steve Rajeff, Loomis’ chief rod designer and the world fly rod casting champion. YouTube. We hear this term often, whether it’s IM6, IM7 or the latest IM9… 60,000,000 modulus, or that one is 22,000,000. Does this matter? What does it mean? Modulus is multiple measurements describing something’s ability to be temporarily deformed when a force is applied to it. Everything has a modulus, the modulus of a steel rod would be very high where a rubber band is very low. Besides just a measurement, the modulus gives us an idea of the recovery speed, durability, and weight of the blank. In general, a low modulus rod would be more durable and flexible, while a high modulus rod would be stiffer and more sensitive, but not as durable. Advertised modulus is usually comprised of the base material. This gets tricky as most rods are made up of a blend of different materials rather than just one, so the advertised modulus is that of the main material rather than the combined. Higher modulus material is more expensive along with being stiffer, thus taking less material to obtain the desired action. The use of less material, obviously, makes for a lighter rod. Though modulus is important, it doesn’t mean a low modulus rod will be low priced. There are many reasons for the varied types of materials. Most of the rod value is in the design, build and components, as you will see in this article and video. Modulus’ we hear advertised are generally in these ranges: IM6 – 40 million, IM8 – 44 million, E Glass – 9 million, S Glass = 12 million. These are all weight measures per standard dimension. NOTE: Featured Image is past ICAST show with Steve Rajeff shown enjoying Loomis’ back-to-back wins of “Best Fly Rod.” Photo flyfisherman.com.